For those of you interested in helping us end the suffering surrounding Lyme disease, if you can not join us at the Tick-Borne Disease Alliance annual fund-raising Gala on May 1 in NYC, please join us live as I broadcast a special show this week LIVE from the event on ‘Lyme Light Radio with Katina’, available on TransformationTalkRadio.com, WBLQ.net and LymeLightRadio.com. Lyme disease is the USA’s fastest spreading infectious illness, four times more swiftly moving than HIV/AIDS and with serious life altering consequences. EXTRA SPECIAL COVERAGE will also include LIVE eTV broadcasting with myself and my syndicate owner and famous radio host Dr Pat Baccilli of The Dr Pat Show. At 6pm EDT on iHeart Live 365 internet television, you will be able to ‘attend’ the Masquerade Ball virtually with us as your hosts !!! Please join our interviews with Dr Brian Fallon, Dr Ken Liegner, Olympic skier Angeli VanLaalen, cyclist John Donnally and now with breaking news of recording artist and performer Debbie Gibson! It has been a fabulous nine months hosting Lyme Light Radio weekly, bringing the best on Lyme disease advocacy and physicians to you all. Now we add television to our mixture. And what a sterling night this will be, as we broadcast the event and our interview internationally, bringing awareness to the world!!! DO NOT MISS this live stream– and share this link with EVERYONE!! Too important and FUN to pass up! Thank you Jodi Nass, Staci Grodin, David Roth, Anita Buckley and the other great folks of TBDA for partnering with “Lyme Light Radio” on this fabulous night! See you all from New York Cit (my home town ;)) as we light up the world!! Read the great information below, too. EVENT IS SELLING OUT BUY YOUR TICKETS NOW! TBDA Mission Statement:Dynamic, inclusive and passionate, the Tick-Borne Disease Alliance (TBDA) is dedicated to raising awareness, supporting initiatives and promoting advocacy to find a cure for tick-borne diseases, including Lyme. Mindful of the urgency of this escalating public health crisis, Turn the Corner Foundation, co-founded by Staci Grodin, and the Tick-Borne Disease Initiative, founded by David Roth, decided to consolidate their efforts in the fight for a cure. In early 2012, they joined forces to form a new, national organization:TBDA. As part of our efforts to raise funds to support much-needed research, TBDA will embark on a quest to develop a diagnostic tool as a first step toward eradicating the diseases. Working with others in the tick-borne disease community nationwide, TBDA seeks to raise public awareness through education and create a unified voice for advocacy regarding the current epidemic in order to make a real difference. Please join us. By working together, we can help eliminate tick-borne diseases for future generations. The Omega Institute in Rhinebeck NY offers a weekend Lyme disease workshop, “Living Well With Lyme Disease: on June 29022. I will be co-teaching with Dr Tom Francescott and Dr Richard Horowitz, author of “Why Can’t I Get Better? This is the first Lyme disease weekend of its kind; offering the most sophisticated medical knowledge with integrated naturopathic medicine and the spiritual aspects known to foster healing from this often complex illness. Saturday night, the Summer Solstice, will include a special healing circle. Renowned musicians will also be joining us, including Greg Kirk of the Zen Engines. Lyme Light Radio welcomes Dr Francescott on air this Wednesday, April 16, at 1 PM PST/4 PM EST. Dr Francescott will be shedding light on the supportive naturopathic medical work he has had such success with regarding Lyme and co-infections. The second half of the April 16 show will include an interview with the famous Lyme Research Alliance (formerly known as “Time for Lyme,”) from Greenwich CT. This extraordinary foundation has been leading wonderful fundraising drives for over a decade to help support research into Lyme disease. This will be a great opportunity for us to learn more about the current BEST research programs going on and the doctors with the most critical pulse point on the epidemic. You can learn more about the Lyme Research Alliance at http://www.lymeresearchalliance.org/. This will be a truly informative show! Join us live on LymeLightRadio.com, TheDrPatShow.com, TransformationTalkRadio.com, and WBLQ 1230 AM in Southern New England. “Lyme Light Radio With Katina Makris” broadcasts every Wednesday, bringing the most informative, inspirational, and innovative interviews to you and all matters related to Lyme Disease. As so many of us realize, Lyme disease, America’s fastest spreading infectious illness, is moving at a rate four times faster than HIV/AIDS in contagion. This is a serious matter that all of us need to focus on. Everyone can be exposed to ticks, the primary carrier of the bacteria. The American Southern states, from Virginia through the deep South and into Florida, are rampant with Lyme disease infested ticks and other insects, yet scant education, awareness, or doctor training has progressed in these areas. Some Southern state infections disease societies do not even acknowledge the illness exists in their states, yet individuals present with the classic early acute infection signs: bulls-eye rash, joint pain, headaches, and fatigue. 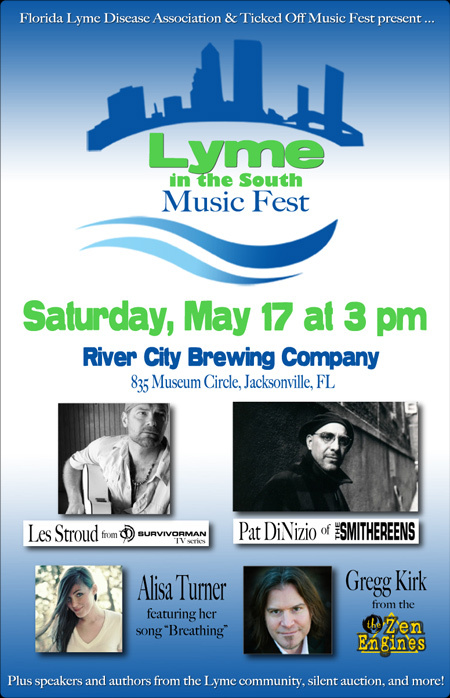 Also, of note is that On Saturday May 17, Jacksonville Florida hosts an important and timely event – the Lyme in the South Music Fest. Please read more below and join us all on he sparkling Atlantic Seacoast for a spectacular showcase of talent, invaluable education, and a great fund-raising cause. The next Ticked Off Music Fest event to kick off is the Lyme in the South Music Fest in collaboration with the Florida Lyme Disease Association. The event is scheduled for Saturday, May 17 at River City Brewing Company in Jacksonville, FL beginning at 3 p.m. The music line-up features Pat DiNizio, frontman of the Smithereens, famous for such hits as “Blood & Roses,” “Behind the Wall of Sleep,” “Girl Like You,” and “Only a Memory.” Pat will be playing acoustic versions of these songs as well as tunes from his solo releases. Also featured is Les Stroud from the “Survivorma” TV series. Les will be playing acoustic guitar & harmonica and will also be educating on tick awareness and prevention. Rounding out the bill is Houston-native Alisa Turner who will be playing her breakout hit “Breathing” about her own struggles with Lyme disease. Also performing is Gregg Kirk of The Zen Engines who will be playing acoustic versions of his band’s material, all inspired by his healing journeys through Lyme Disease. Speakers include Katina Makris (Lyme activist & author of “Out of the Woods”), Dr. Kerry Clark (a University of North Florida professor of epidemiology and environmental health who has published ground-breaking studies confirming Lyme in the South), and Lyme-literate physician Dr. Shirley Hartman. Come on down! You will not be disappointed and in turn have time of your lives! I know this event opens the door for much needed change and success on many levels. I would love to see you there.